The Legend of Zelda: Breath of the Wild is a fantastic video game. Indeed, for all intents and purposes the game is perfect. It delivers an intoxicating blend of open-world adventuring, tight and mechanically slick combat and, something few games ever manage, a wonderful real sense of time and place. It is a combination of decades worth of the best bits from past The Legend of Zelda titles and, if you have a Nintendo Switch - or even a Wii U - it is an ESSENTIAL purchase. But, you and anyone else with half an understanding of video games knew that already, right? The crucial reasons as to why follow. Before we get into the review proper, however, why not check out The Legend of Zelda: Breath of the Wild's epic launch trailer, as it not only manages to set the scene and give a basic introduction to the game's plot and characters, but also shows off one of the game's key strengths, its massive and beautifully realised open world. Indeed, if you were to state one thing above all others that The Legend of Zelda: Breath of the Wild delivers, it is its wondrous and far-reaching open world. Past The Legend of Zelda games have always had some degree of open world, with players typically using a central map world hub to unlock and then reach game-progressing dungeons, however here in 2017, this has well and truly been transformed by Nintendo. If you want an idea as to the size of The Legend of Zelda: Breath of the Wild's map then think more games like The Witcher 3: Wild Hunt and less The Legend of Zelda: Twilight Princess. 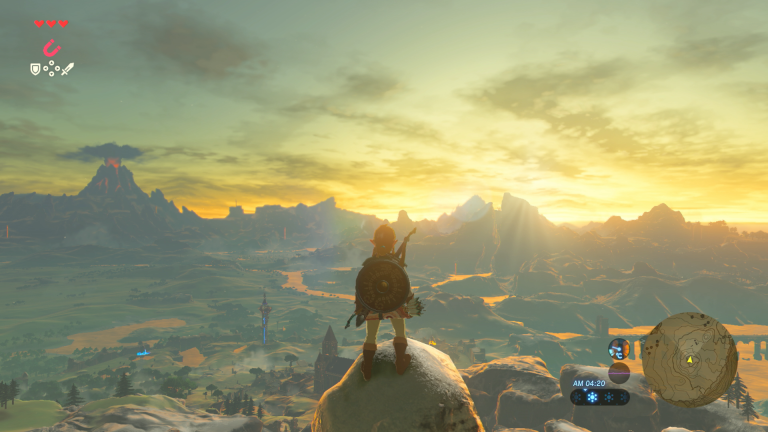 The world Link wakes up to in Breath of the Wild is just HUGE, with seemingly endless vistas on show in almost every direction. The landscape changes too and varies dramatically, with snowy tundras and icy peaks giving way into lush jungle forest, windswept heath lands, brutally hot and barren deserts and even, at the edge of the world, tropical ocean-lined beaches. Needless to say that if you set out on foot in The Legend of Zelda: Breath of the Wild, it takes you a LONG time to get anywhere, let alone reach one side of the map from the other. Which is why Nintendo very smartly gives the player two incredibly useful tools to aid their adventuring, a glider and - once caught in the wild and tamed - a horse. Partner these with Link's ability to climb almost any surface, even vertical cliffs (more on this later, as it relies on stamina), and The Legend of Zelda: Breath of the Wild is packed with moments where you see a place and, almost magically, can make your way there, no matter how inaccessible at first it looks. There are no invisible barriers stopping you climbing Hyrule's tallest mountains in Breath of the Wild, which are unique challenges in their own right, and no strict funneling by the programmers. Your skill permitting, you can go anywhere you like, and that is incredibly empowering. And you will need skill to survive in The Legend of Zelda: Breath of the Wild. The game is by no means incredibly hard or unfair, in fact its combat mechanics are typically Zelda tight and refined, however what you will have to get used to is Link taking big damage from almost all hits. At first, with the odd blow by an enemy creeping through your rusty defenses, it can seem harsh, however when you get into the rhythm of the game's combat and, crucially, start making use of your weapons and items in the correct manner, suddenly it all seems incredibly fair and well balanced. Weapons come in a wide-variety of types, styles and power, however almost every single weapon is degradable upon usage. Think the Giant's Knife from The Legend of Zelda: Ocarina of Time, which after a certain amount of blows would break and need to be repaired again for full-power use. As such, weapon and inventory management (you can only hold a certain amount of weapons, shields, and bows at any one time; this can be upgraded and expanded however) is crucial to succeeding at The Legend of Zelda: Breath of the Wild's combat, as you need to react to enemies by identifying their weaknesses and then exploiting them. Weapons can be attained by beating enemies - if you knock one down, forcing it to drop its weapon, you can even pick it up before they get a chance to, disarming them - found in the game world, received from NPCs, acquired via merchants or gifted by beating difficult bosses and dungeons. Weapons can be handheld (like swords, spears and axes), ranged (like bows), or both, with most weapons directly throwable by Link as an alternate attack. Obviously, unless you are using a boomerang, you do then have to go and pick said weapon back up if thrown. Naturally, The Legend of Zelda: Breath of the Wild's iteration of Hyrule is absolute ram-packed with unique and, quite often, crazy characters for you to discover, with many nods to past titles included too for the long-term fan. Staple races like the aquatic Zora, rock-loving Goron and stealthy, sand-dwelling Gerudo are all present, as too their distinctive habitats and cultures. Mechanically The Legend of Zelda: Breath of the Wild - despite the huge open world - works remarkably similar to past Zelda games. There are core - story progressing - "dungeons" that need conquering in the form of the game's Divine Beasts, which typically grant Link new powers, weapons and items to help him defeat the game's big bad (good old Ganon returns again), as well as a dump truck load of well-crafted side quests, collectibles and puzzles that can be optionally taken up if desired. The Legend of Zelda: Breath of the Wild does introduce two new-ish mechanics to the game though, shrines and Shiekah Towers. Shiekah Towers are large, climbable towers that are dotted throughout Hyrule's various lands and, when climbed by Link and activated via a top-mounted pedestal, light up and illuminate the region on the player's map. The mechanic works exactly like climbing synchronization points does in the Assassin's Creed series, even going to the extent that once activated the player is treated to a 360-degree panning shot. The other, more significant introduction, is that of 100 shrines throughout the game world. These act as micro-dungeons, typically only taking 5-15 minutes to complete, and task the player with a variety of challenges ranging from physics-style puzzles to out and out combat. By completing these shrines successfully, the player is rewarded with a spirit orb which, once four are collected, can be traded in for either an extra heart in Link's health bar, or an extra segment in his stamina bar. And, it is the stamina bar that should arguably be improved first in our opinion, as it determines how long Link can climb and how long he can fly with his glider. Doesn't sound that important, right? Wrong! As we mentioned at the beginning of this review, exploration is largely key to progressing in this game - after all, you have to even find Link's Master Sword rather than it being handed to you on a plate, and exploration is helped MASSIVELY by climbing and flying. Indeed, with a big fat extended stamina bar Link can climb Sheikah Towers more easily, therefore revealing more of the map's locations of interest, or can glide for miles surveying the world's most challenging locations for a good place to attack and win the day. While the 100 shrines in the game are built for short applications of lateral thought and controls mastery, with Link's various powers such as Stasis (the ability to halt time's flow on certain objects; check out the halting of the stone ball in the above picture), where the game slips more back into The Legend of Zelda's traditional longer-form dungeons is with the game's plot-critical Divine Beasts, huge titan-like machines that while once created to beat Ganon, have now been taken over by him and are causing chaos in Hyrule's various regions. These Divine Beasts, mechanically, are broken into three stages, with a first stage of getting onto the beast, a second stage of taking back control of it inside by activating a series of terminals, and a final stage where Link has to face off against a boss character. While each Divine Beast is different, this basic structure holds, tasking the player each time to overcome movement, combat and mental challenges to progress and free the beast from Ganon's control. Once the Divine Beast is freed, not only is Link granted with new powers and items that can help the player best Ganon, but the Divine Beast itself also adds its power to the end fight, making the end game easier. Interestingly, although T3 didn't attempt this, according to Nintendo the player can technically go and face Ganon whenever they want, without freeing any of the Divine Beasts or even really exploring the game world and powering up. While the vast majority of players will never attempt this, it is really quite cool that The Legend of Zelda: Breath of the Wild is programmed this way, as it empowers the player to an even greater degree to play the game their way - no doubt the Zelda speed run community will absolutely adore it. Indeed, the feature highlights another of The Legend of Zelda: Breath of the Wild's major strengths - the player is free to not only undertake challenges set by Nintendo, but also create challenges for themselves on the fly. For example, while a path may lead up to a Sheikah Tower, lined with a series of enemies that would need to be overcome in order to get there, maybe the player could utilize parts of the landscape, their mastery of cookery (which allows you to create food and stat-buffing elixirs) and specific items to reach the top without any combat taking place at all. Artistically, The Legend of Zelda: Breath of the Wild is not only consistent with past titles, but also absolutely stunning. The world of Hyrule has never been so well-realised, with the game's bright cell-shaded graphics, vibrant character, location and object designs, as well as beautiful musical score and ambient sound effects creating a superb sense of place. When the wind blows grasses rustle and sway in the breeze, when rain and lighting sweep in the landscape and Link are transformed by the downpour soaking everything though, and when the sun rises above Hyrule Castle, illuminating the Studio Ghibli-style flora and fauna, the views are just breathtaking. This wonderful sense of in-game place is partnered with a very clear idea of in-game time too. Various NPCs introduce the game's story to the player throughout their time playing it, retelling an epic tale that began 100 years previous and one that is laced with sadness and regret. This story adds genuine gravitas to the events that the player undertakes in the present and, at times, is genuinely mature in its tone. Tears are shed, uncertainty laid bare and, despite the colourful and vibrant world Link adventures in, a this-is-a-last-roll-of-the-dice darkness pervades The Legend of Zelda: Breath of the Wild. Indeed, the game manages to communicate that the tale you are enacting is not only eternal, part of the the never ending flux between yin and yang, light and dark, and good and evil, but one that is truly legendary. As King Arthur pulling the sword from the stone has passed into legend, so too have, are and will be the actions of the Hero of Time. Which, in a long way round, brings us onto the finale and the oh so important question of where this game ranks in the pantheon of The Legend of Zelda games. Has Breath of the Wild become a legend in its own right? For many gamers, due to the fact the first game in a series someone plays is often their favorite, a phenomenon wrapped up in the golden days of childhood and, now, huge swathes of nostalgia for simpler, more innocent times, we think that despite them finding The Legend of Zelda: Breath of the Wild an incredibly enjoyable, impressive and playable game, the call of classics such as The Legend of Zelda: Ocarina of Time will prove too much, finding Breath of the Wild enter a top three list but not take the top spot. However, from the most objective perspective we could muster here at T3 Towers - and trust us, when you've played titles such as The Legend of Zelda: A Link to the Past during your formative years, that is an incredibly hard thing to do - we feel it is quite evident that The Legend of Zelda: Breath of the Wild is, by quite a distance, the best The Legend of Zelda game ever made. And, what's more, for those people for who Breath of the Wild will be their first foray into the wonderful world of Hyrule, Zelda and Link, it is going to absolutely blow their minds. The Legend of Zelda: Breath of the Wild is available now in both a regular and special edition on Nintendo Switch, as well as on Wii U. For more information about each edition check out Nintendo's official website.